Happy Wed! We are nearing the weekend, and I am happy about it. I can actually say that today was a pretty good day. It is a nice change from what I have been having at work. As I mentioned in last night's post - I wanted to make a couple of cards to take my mind off of all the rain we've been getting here in Missouri. I wanted to share with you the other card I made. 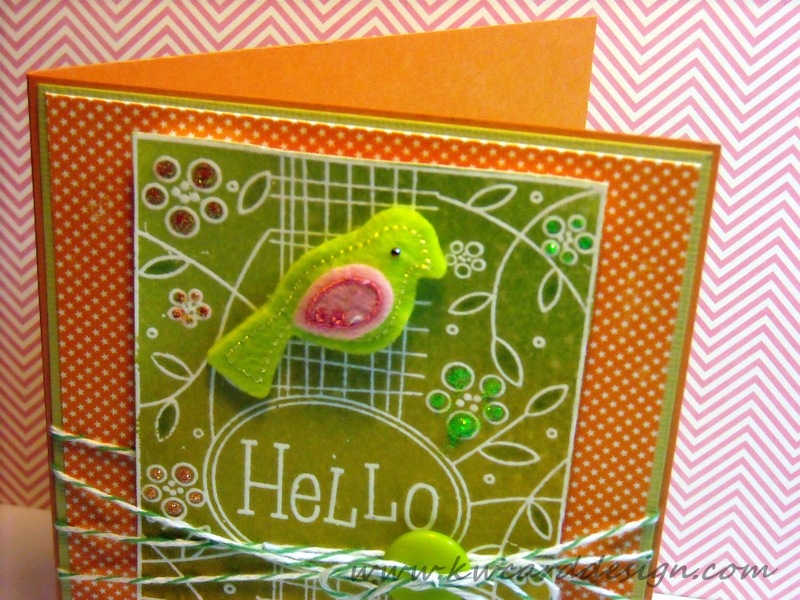 I used a new Hero Arts Cling Stamp I purchased. I thought it was so cute. I am sure you could do so many variations with this stamp. 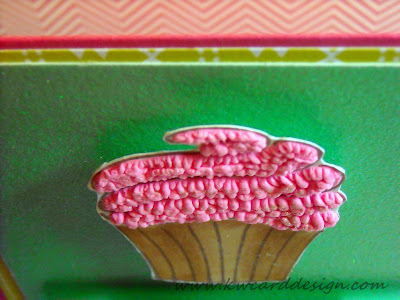 I first embossed the image on Gina K. Designs Pure Luxury White card stock with clear embossing powder - then did the emboss resist technique, and used some Distress Inks to color in the image. 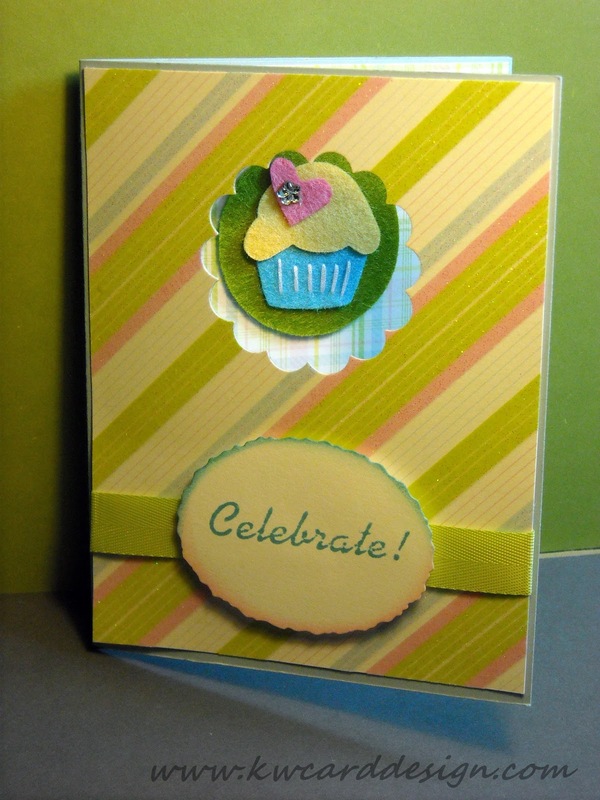 I like embossing on this card stock because it is so thick - there is very minimal warping. 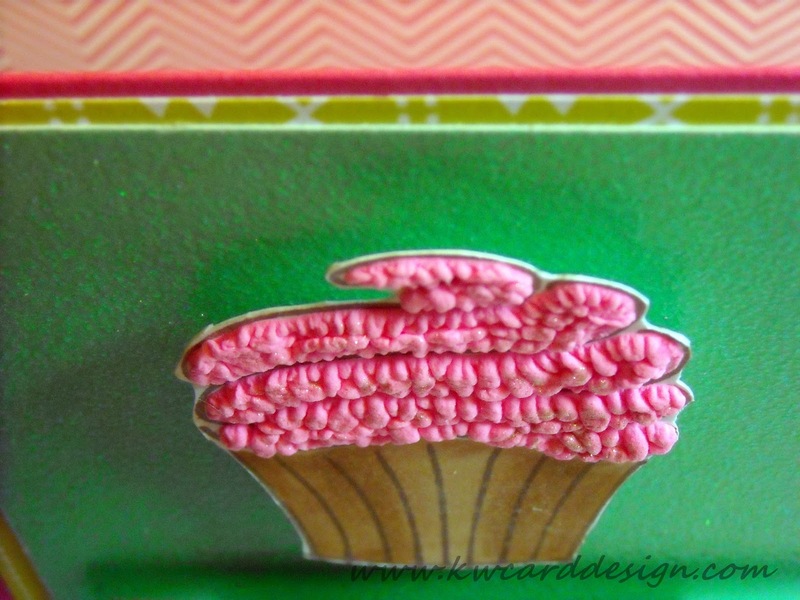 I used some pattern paper from MM 6 x 6 "Just Chillin'" stack. 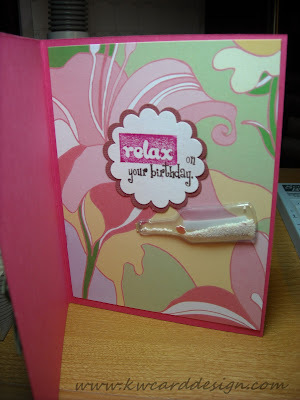 I also used some Bazzill card stock I had to create my matte. 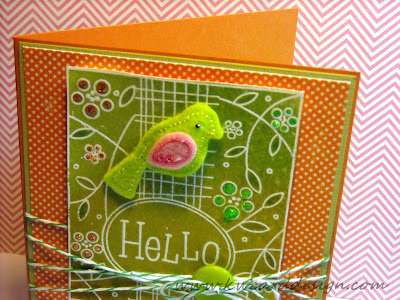 I popped up my "Hello" image with pop dots after cutting it out. I added some "stickles" for some shine on the flowers, added some Baker's Twine in green, and a cute little button from BG. The little birdy dimensional sticker is from KI Memories called Puffies. These things are so stinkin' cute!! I gotta get more of these!! Well - It is time to go watch some TV! Have a relaxing day and night where ever you are in the world!! Till we meet here again! Hi all! It has been a few days since I have posted. It has been a VERY rainy, wet, and flooded area where I am. Trying to stay afloat, and also for Easter, my hubby and I went to St. Louis for a long weekend, and returned yesterday to more rain! It was a beautiful day today - and now, once again, more rain. I'm lucky I live up higher than some of the neighborhood. I cranked out a couple of cards - cause I wanted to focus on something happy, and making cards always makes me happy. So - here is one of them. 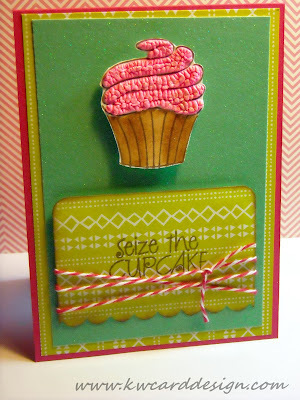 I wanted to do something fun and festive, and what is more fun than cupcakes! I also wanted to share that I have received another blog award - and I will make a posting of that in a day or two. 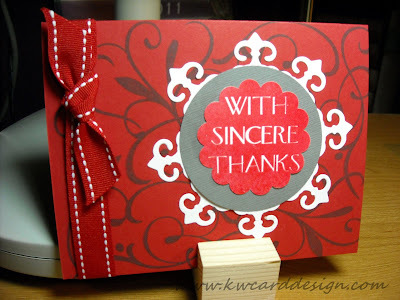 For now, I wanted to thank Angie @ http://angiescraftblog.blogspot.com/ for awarding me the Versatile Blogger Award!! OK- that is it from me tonight. Have a good evening!! It looks to be shaping up to be a stormy Tues. evening. Since I can't watch my St. Louis Cardinal's game - how about a card share. 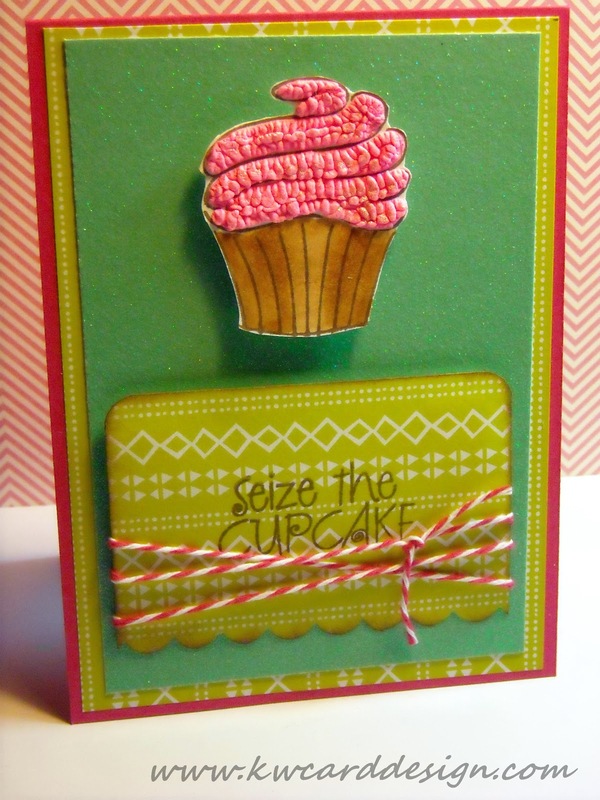 I made this cute lil cupcake card for, surprise, a co-worker. Her birthday was last Sat. I wanted to make her something bright and festive! You can't really tell in this picture - but the outside has glittery paper from one of my DCWV stacks. 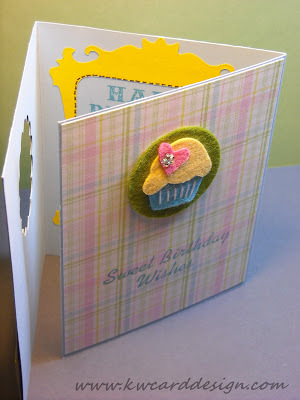 I love this felt embellishments. They are so much fun, and add something fantastic and quick to your card. I am not sure if any of you follow what goes on with PaperCrafts Magazine but they have this contest yearly - called the Stamping Royalty contest. I plan to enter this next year, but I just love the story of the winner that was just announced last week. The day she won the contest - was the day she had her beautiful baby boy. Check this out. What a precious baby boy. Congrats to her!!! Till next time my fellow crafters!! 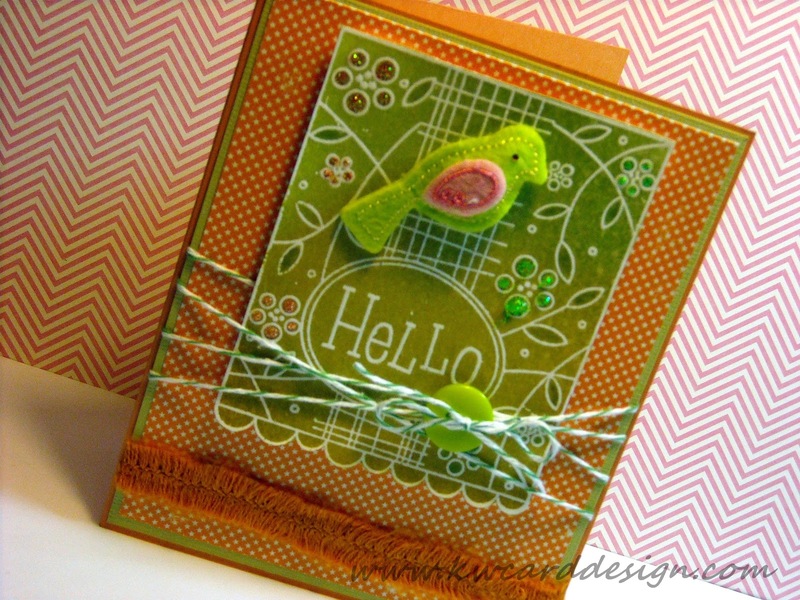 Hi crafters and blog readers. My Sat. evening is being spent just relaxing and taking in the time off to do "whateva". 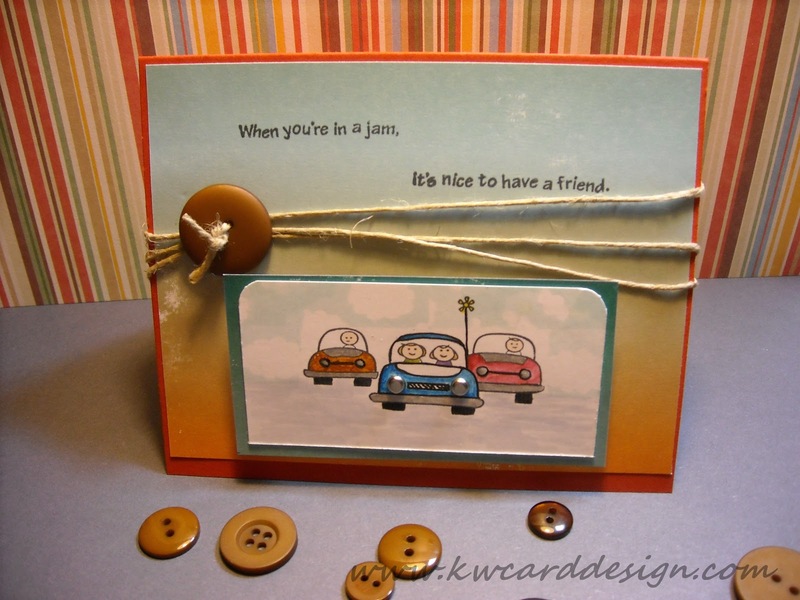 I wanted this evening to share with you a card I sent to my brother, sis in law, and two nephews. They live about 4 or so hours from me - and right now the whole family is really busy is baseball. Since I don't get the chance to see them all that often - I wanted to let them know that they were thought of, and that I loved them - Just because. I am really into making "window" cards right now for some reason. I just love the "extra" something it gives to a card. 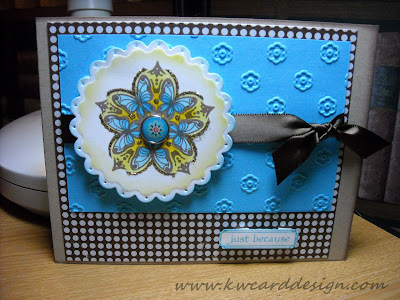 You can do lots of things with window cards - and embellish them lots of different ways. 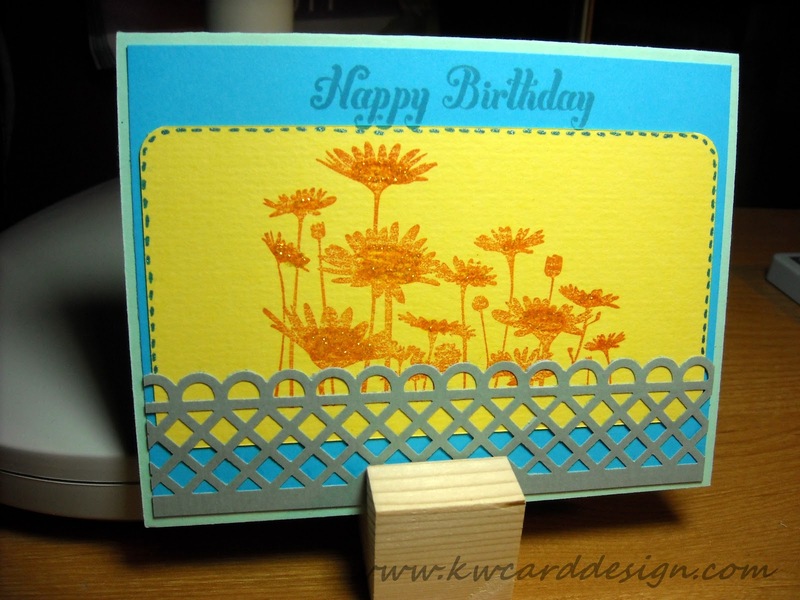 I made a birthday card tonight with the same window effect, but a different variation. I will share that card with you very soon. Well - I'm gonna run. I bought some more "storage" for my room, and I need to put it together. I LOVE storage! Night!! Hi all- I wanted to pop in and share another creation - and also share with you that today is my 4th wedding anniversary! I was thinking back today 4 yrs. ago at different times where I was - and what I was doing before Chris and I said our " I do's". That day was the happiest day of my life. I found my soul mate, and my best friend. The best part is that we get closer each and every year. I love him more and more every day, and the great thing was - I knew how I felt about him the moment I laid eyes on him Dec 13, 2003 - our first date! It was meant to be for sure! Today I thought I would share my "Just because" card I made for a co worker. Bonnie is pretty new to my dept. at work - and you could tell she was a little overwhelmed with everything that she has to learn, and process...so I made her this card to perk her up - and also because I found out from her she liked butterflies like I do! 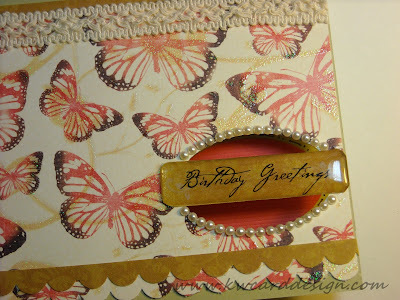 So - I knew I had bought this new "Flower butterfly" stamp. That isn't the name - just what I am calling it. I love browns and blues together! I used some pattern paper from that same pad I used a couple of posts ago from MM called "Just Chillin" - embossed a piece of scrap blue paper with one of my cuttlebug folders, and added some chocolate ribbon from PTI. I stamped the butterfly flower image on this scallop die cut, colored it with some copics, and added some gold stickles to make it pop! I also added an epoxy brad in the middle that really went well with all the colors. Before I go - I posted on one of the forums at Two Peas in a bucket if anyone new where I could find one of the Dark Pink Cuttlebug machines. They were sold exclusively thru HSN last year - and since my V2 machine broke - I am looking to replace it. If any of you crafters know where I could get one from someone that might be selling theirs - PLEASE contact me!! I want one really bad!!! I'm back to share with you another card. 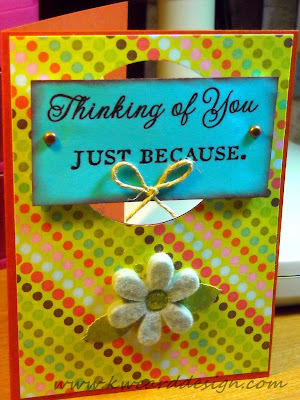 It is a beautiful Sunday afternoon - and since I had some time - I wanted to share with you a card I made on Thurs. evening for a friend/coworker of mine. 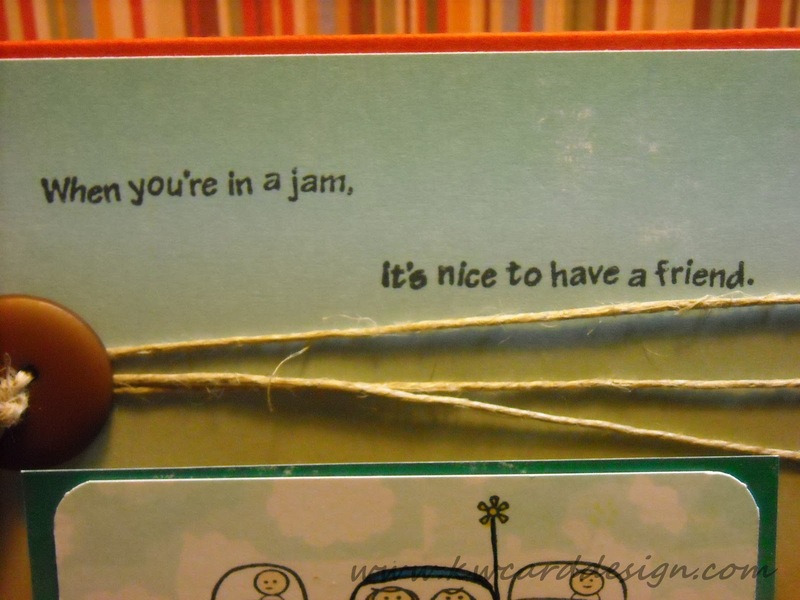 I have some very supportive friends - and I always want to show them that I appreciate not only their friendship, but their confidence in me with my crafting. This card features this mini stamp set from Inkadinkado. 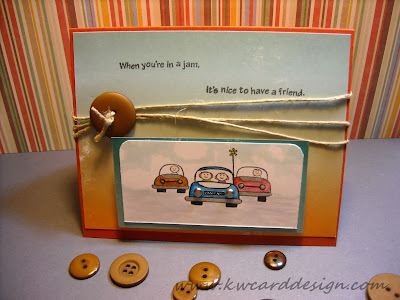 I thought it was very cute - and knew I could make some cute cards with it. 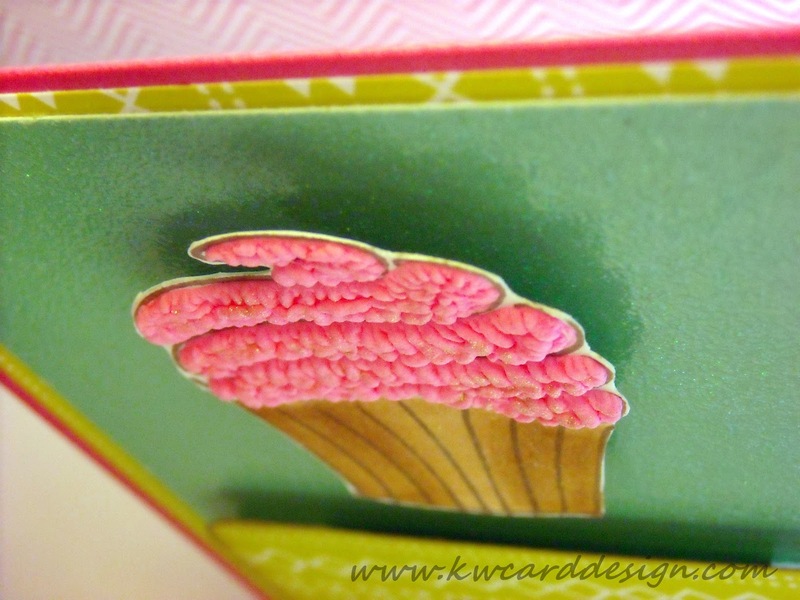 I used "Pure Poppy" card stock from PTI for my card base. I also found this 6 X 6 paper pad at Tues. 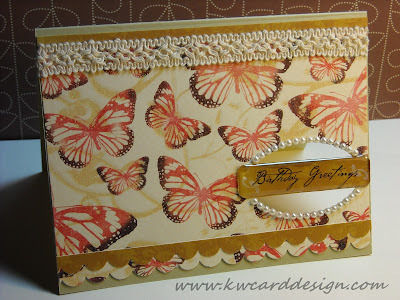 Morning ( not KMart ) and used one of these patterns to mat on my card base. It really complimented everything with the image - and brought it all together. I added some silver brads for the "headlights" for a little fun, and then added some twine from SU, and a button from a button pack I had from Making Memories. I thought it turned out cute and fun. Enjoy the rest of your weekend everyone - and I will meet you back here soon! 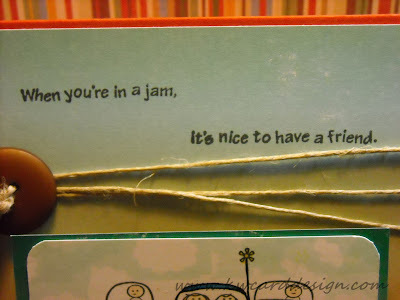 Good Sunday afternoon crafters! It is a balmy 82 degrees here in SC Missouri!! I can't believe it. It has been beautiful this weekend to get out and do whatever makes you feel good. I got a ( new to me) used fridge from some friends of ours. It is a nice fridge, and I am stoked because we have the option to have a nice glass of cold ice water from the convenience of the door! I'm tellin' ya - the little things make me happy - most of the time. Today - I thought I would share with you two cards I made for my mom's best friend, Linda. She is like a second mom to me - she and my mom have been friends for YEARS ( over 34 yrs which is how old I am - and more ). She loves anything tropical, and who could blame her in these stressful times. Thinking of a tropical getaway always sounds nice. 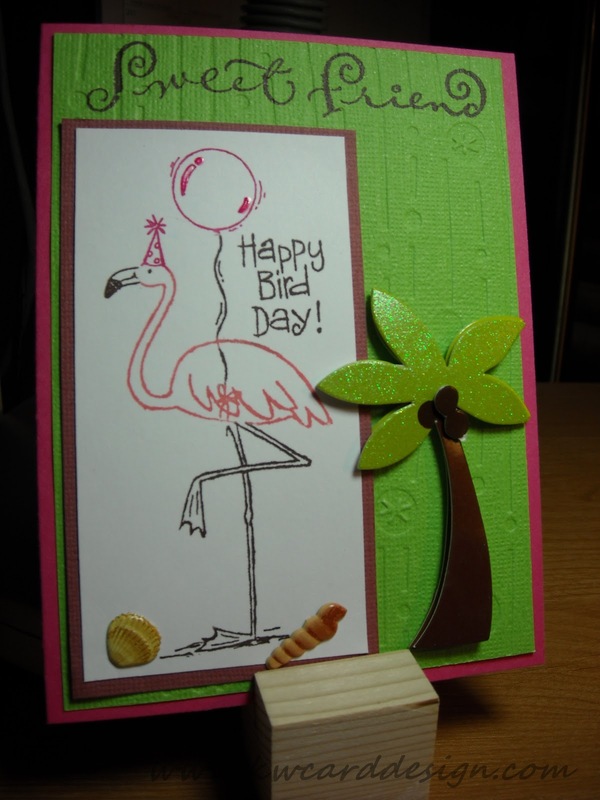 So - I made her a tropical birthday card on request of my mom - and then I made her one from me that was bright and cheery. And the inside - which has my favorite part - the "bottle with sand and seashells"
Then this is the one I made for her - the stamp set I used for this one is "Upsy Daisy" from SU. It is such a cute little stamp set. :::On another note::: - I have done two haul videos - and will be posting them up on You Tube soon. I gotta find a different format for my videos because they take so long to load. Anyway - be on the look out for those!